Perhaps you may have heard of this unusual dish that is sure to be a standout for your next large dinner. Your guests will be amazed! 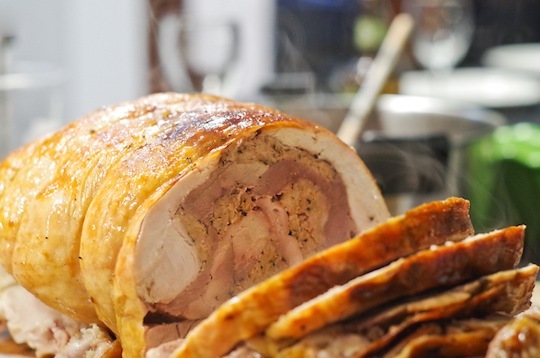 a deboned turkey that is stuffed with a deboned duck that is stuffed with a deboned chicken, sometimes also containing a breadcrumb or sausage meat stuffing. 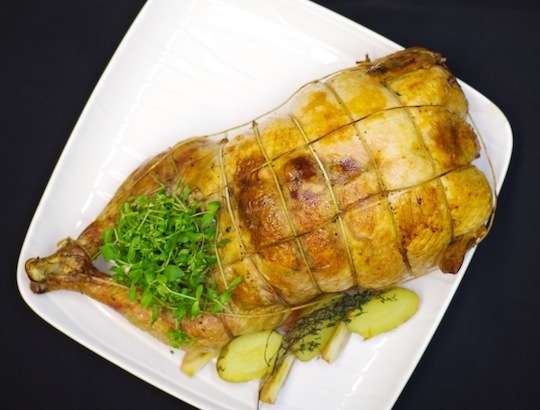 Our turduckens are not mass produced or frozen, each one must be pre ordered and prepared specifically for you. 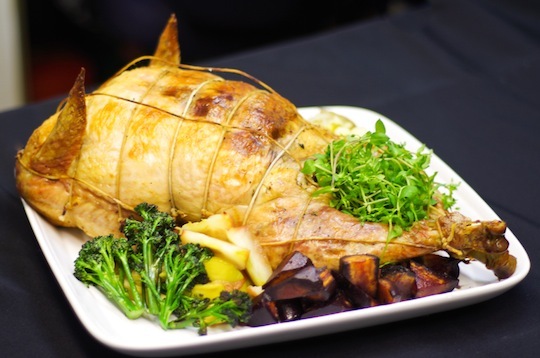 Our turducken is a turkey stuffed with layers of chicken and duck. The cavity of the turkey and the rest of the gaps can be optionally filled with our house made sausage (your choice of chorizo or Italina) or bread stuffing. This bird within a bird within a bird is bound together with butchers twine. 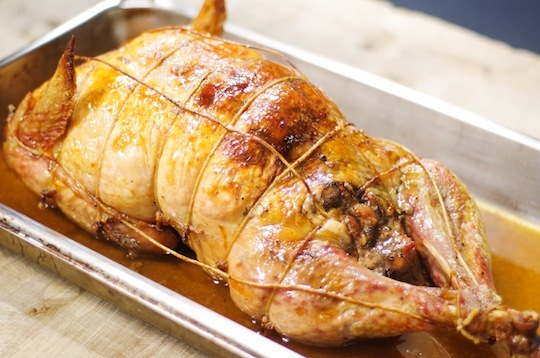 After Windsor Quality Meat’s professional preparation it looks like a regular stuffed turkey and is ready to go directly to the oven. 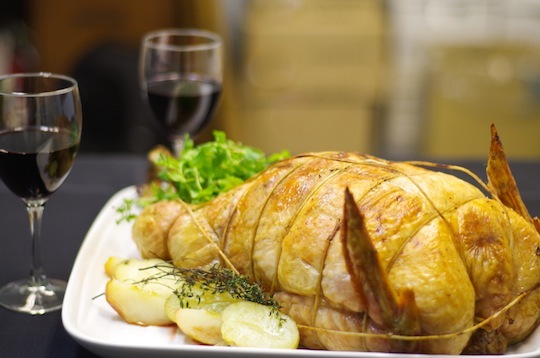 Apart from the turkey drumsticks and wings the turducken is completely boneless, and when sliced like a roast, every diner gets a nice cross section of every component ensuring everyone receives some delicious duck, chicken, turkey, and sausage or stuffing. 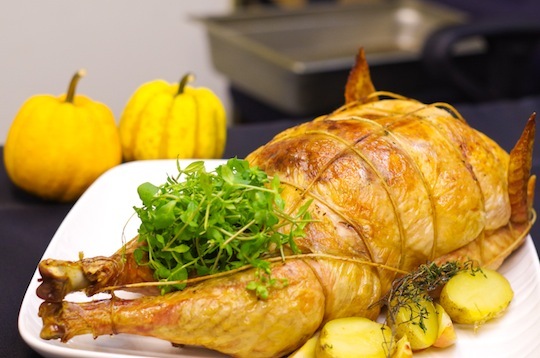 We at Windsor Quality Meats have been making turduckens for years and it is a popular choice for large and affordable dinner events, holiday gatherings or anytime you want a big feast. All our turduckens are made from free range birds consisting of a free range, hormone free turkey from Skye Hi farms in the Fraser Valley, a free range duck and a Maple Hills hormone free chicken. The combined weight is around 13 to 15 lbs for $200. This is usually enough to feed about 12 to 15 people. NOTE: We need about 2 days notice to prep either package for you. Sausage stuffing, your choice of chorizo or Italian. Bacon wrapped around the outside of the turkey, strips across breast. Detailed instructions on how to cook your turducken after purchasing from Windsor Quality Meats. Pre heat oven to 225 to 250 degrees fahrenheit. Put on a rack over a drip pan; the rack promotes more even cooking. Putting it on a flat bottom pan will make the bottom cook too fast. Rotate rack every hour or so if you don’t have a convection oven to heat evenly. ACCURATE TEMPERATURE IS EXTREMELY IMPORTANT! Probe intermittently, Use a good probe thermometer. Probe inserted right in the middle should read 140 degrees. The skin will be dry with slight light browning. Turn the oven up to 450 degrees to raise internal temperature to 160 degrees and to further brown and crisp the skin. This will take approximately 30 to 40 minutes but let the thermometer be your guide. While the cooking time is based on internal temperature budget around 4 to 6 hours cooking time for planning purposes. 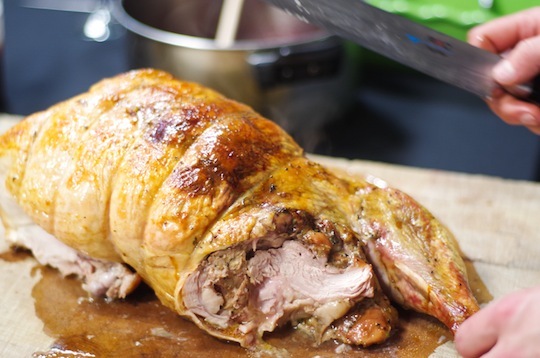 Want To Try Making A Turducken On Your Own? We have instructions on how to make a turducken here.